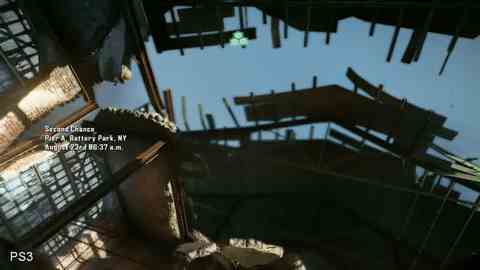 Some say that the company's "Maximum Game" ethos has been compromised by building something that simply must run well on five-year-old console hardware, while others point to the technological leaps being made in the core functionality of the new CryEngine 3 - features which are more refined and enhanced in the higher-end graphical presets exclusive to the PC game. Behind the argument lies the uncomfortable reality that life for a PC-exclusive developer isn't easy in the current climate, and AAA development costs can only be recouped by shifting to a multi-platform strategy. There's no doubt whatsoever that Crytek's priorities have changed and that supporting console has helped to shape and mould Crysis 2, perhaps in a somewhat different direction than it might have considered for a PC-only release. Back when the Frankfurt-based developer envisaged the original Crysis, it created an engine spec so advanced that current-generation hardware couldn't run it (in a playable form, at least) on max settings. It was a game built to scale up as graphics technology evolved and became more powerful. True, there was also a level of unoptimised code holding things back (partly addressed in Crysis Warhead) but the intention was clear to see: this was a game that was technologically forward-looking in many ways. Compare and contrast with Crysis 2. While CryEngine 3 scales up to next-gen specs, this first CE3 release is definitely designed with the hardware of the past in mind rather than the technology of the future. This is good news for the console audience, getting its first taste of Crytek's cutting edge visuals (read more about that in our Crysis 2 console face-off), but what of its traditional PC audience? What do they get out of the deal? Enhanced performance on present-day hardware for starters, but there are other bonuses too. The abundant power of the PC is used to streamline and improve the existing gameplay experience, and to add to the quality of the visuals. In this sense there's no doubt whatsoever that Crysis 2 on PC is the best version of the game you can buy. However, it is difficult to avoid the conclusion that it could have been significantly better in some key areas, and perhaps too much of the core console DNA has filtered its way across to the PC version. Before we go any further, let's break out our first comparison video: Crysis 2 running at 1280x720 on Extreme spec, up against both console versions of the game. In addition to this is a full-on triple-format Crysis 2 comparison gallery for your considered perusal. Surprisingly for a studio with such a rich PC heritage, graphical options and settings in Crysis 2 are pared back to the absolute minimum. Players can choose the target resolution and whether to engage v-sync or not, with graphical quality limited to High, Very High and Extreme settings - an absurd simplification of a massive gamut of different visual settings. Crytek says that the console versions operate at the High level, but in truth it seems that even at this setting the PC is running with more light sources producing more dynamic shadows, an effect that scales up still further as you move on up through the higher graphical levels. The main issue here is that the base quality level is very good already, and further visual refinements are subtle and difficult to notice, especially in the heat of the action. Probably the most impactful change is in lighting and geometry LODs, but the actual visual payback PC owners get beyond better frame-rates and higher resolution isn't the night-and-day different you might hope for. That said, there's little doubt that the PC game manages to power past most of the more annoying aspects of the console versions' performance. For a start, geometry and texture pop-in are (almost) completely eradicated in the PC version, and this instantly makes a positive impact to the quality of the experience. According to Crytek, the streaming system used on console isn't implemented on PC, with the larger system resources on tap used to hold everything in memory. More importantly, the performance flashpoints that brought the frame-rate crashing down on the Xbox 360 and PS3 renditions of Crysis 2 are all but gone. Interestingly, while playing the game through at 720p60 for the purposes of the comparison video, what was immediately apparent was that the slick, smooth feedback made it a hell of a lot easier to progress even when using the joypad. The interface between player and game was that much more responsive and enjoyable to use. Higher frame-rates and superior visual consistency also allowed animation and physics to really shine compared to the 360 and PS3 versions. The subtlety and refinement of Crytek's effects work truly finds its home on PC. On the minus side however, texture quality on the PC version is fairly uniform with the console SKUs. Some environmental artwork looks blocky even at the target 720p resolution, and the deficiencies of these textures become much more apparent at 1680x1050 and beyond. While the additional visual refinements afforded by the engine are very welcome, it's difficult to believe that higher-resolution versions of the base art assets don't exist. Upscaled Xbox 360 1080p output up against the PC's native 1920x1080 res... It's fair to say that improved temporal resolution in terms of smoother, higher frame-rates is just as important as the number of pixels in the framebuffer.